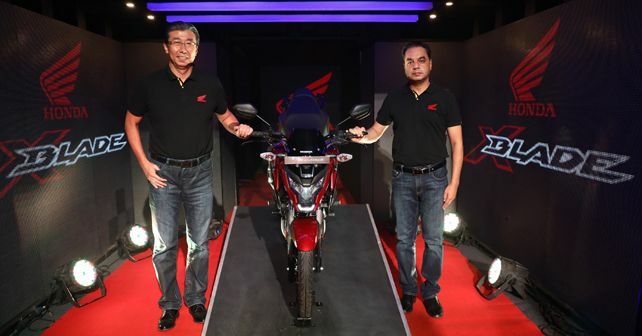 The X-Blade now gets a single-channel ABS unit, same as the one seen on the CB Hornet 160R. Honda Motorcycles and Scooters India Pvt. Ltd. (HMSI) has introduced an ABS-equipped version of the X-Blade, launched at ₹ 87,776 (Ex-showroom, Delhi). This seems to be in line with the fast-approaching deadline of equipping all bikes displacing 125cc or above with ABS as standard fitment. While the standard, non-ABS version of the X-Blade retails at ₹ 79,768 (Ex-showroom, Delhi), the ABS version carries a premium of around ₹ 8,000. The single-channel ABS unit supplements the 276mm disc at the front and the rear wheel makes do with a 130mm drum setup. To differentiate it from the standard model, Honda has given the ABS version some styling tweaks with an under-cowl cover, front fork cover and striping on the wheels now available as standard fitment. Mechanically, the bike remains unchanged. It is still powered by Honda's 162.7cc HET air-cooled engine which develops 13.93bhp and 13.9Nm of torque and is mated to 5-speed manual gearbox. Suspension duties are carried out by telescopic forks at the front and a monoshock at the rear. The X-Blade is also the first bike in its segment to feature an LED headlamp. Available in five colour options, Honda has priced the X-Blade ABS within a hair's breadth of its rival, the Suzuki Gixxer ABS (priced at ₹ 87,871).